As of Christmas 2004, the Apple iPod accounted for two out of every three digital music portables sold. Christmas of 2004 also saw the emergence of dozens of "iPod Killers" from numerous makers all looking to cash in on a hot market the iPod spurred. So hot, in fact, it drew Motorola back into the consumer music device field. But there were many players that came before the iPod, and without these groundbreaking products, the market would not be where it is. This third and final installment is a wrap-up of earlier players not covered in the first two articles. Figure 1. The AVC Soul/D-Link DMP, ca 1999, was the first portable to offer 128MB built-in as an option. AVC Soul/D-Link DMP (1999). 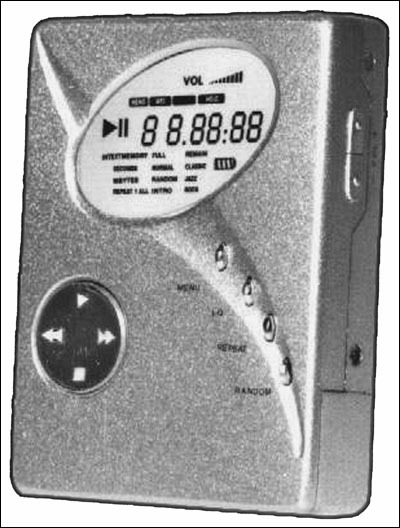 When I published my online review of the AVC Soul, shown in Figure 1, in December of 1999, it was the first MP3 portable to offer 128MB built-in as an option. It turns out the review unit I was given may have been the only such endowed player to hit the states as most of the U.S. sales of this otherwise mediocre player came under the D-link brand without the 128MB option. It wasn't until the release of the Intel Pocket Concert that a 128MB player would be mass-produced. Figure 2. 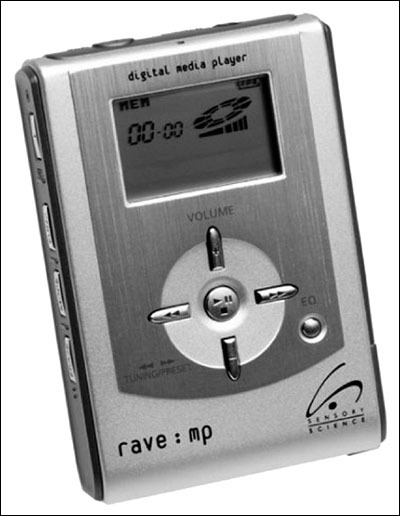 The Sensory Science MP2200, ca 2000, was considered the best MP3 player until Intel's Pocket Concert came along. Sensory Science MP2200 (2000). 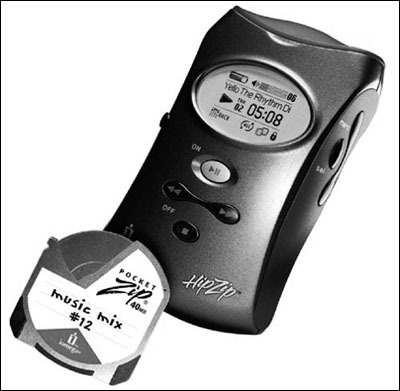 Sensory Science made the best MP3 players in the early digital portable days, and the MP 2200, shown in Figure 2, was their best player. Clad in a brushed aluminum body with an intuitive transfer interface, the MP2200 set a standard which held until the release of Intel's fine Pocket Concert. Sensory Science was later purchased by SonicBlue, who merged them with the best selling Rio brand the company acquired a year earlier. Figure 3. The Sensory Science MP2300, ca 2000, utilized Iomega's new "Clik!" technology. Sensory Science MP2300 (2000). 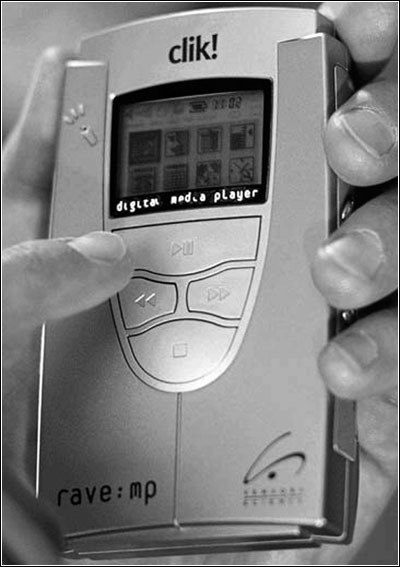 Sensory Science's third MP3 player, the MP2300, shown in Figure 3, utilized Iomega's then new "Clik!" technology. The tiny Clik! disks held 40MB of memory and cost only $10 each -- a tenth of what a 32MB flash memory card cost then. They provided a player that was both small and had reasonably cheap storage. Here was another solution to the capacity/size/cost struggle with which early MP3 manufacturers had to deal. Unfortunately, Clik! didn't click with consumers, and this excellent player faded in the sunset. Figure 4. The Iomega HipZip from 2000 failed to promote the company's "Clik!" technology into the digital music marketplace. Iomega HipZip (2000). The HipZip, Iomega's only entry into the MP3 portable market, shown in Figure 4, was developed to promote the company's Clik! technology into the digital music marketplace. Clik! was supposed to be the successor to the company's popular Zip drives, and the technology was, indeed, a jump forward in providing low cost storage for digital music portables. Unfortunately, the HipZip and Sensory Science's MP2300 failed to draw enough buyers to entice other manufacturers to support the format. Figure 5. The Sony Stick Walkman from 2000 had the fatal flaw of playing only songs compressed in Sony's ATRAC3 format, instead of the widely used MP3 codec format. Sony Memory Stick Walkman (2000). A good player with a critical flaw, the Memory Stick Walkman, shown in Figure 5, was not an MP3 player. Instead, it played only songs compressed in Sony's competing ATRAC3 format, a trait shared by all of Sony's digital music players. That trait turned out to be fatal, as buyers bypassed the brand for others that could play their music in the MP3 codec in which their digital collections were already formatted. Expect all early Sony portables to be scarce as the years go by. Figure 6. The Empeg Car/Rio Car, ca 2000, was the first in-dash MP3 player for automobiles. Despite the high prices ranging from $1,199 to $1,999, these sets were enormously popular. Empeg Car/Rio Car (2000). Empeg Ltd. was a British electronics firm that built the first in-dash MP3 player for automobiles. Models possessed 10GB to 60GB of hard drive storage and offered a choice of a Blue, Green, Amber or Red display. Prices started at $1,199.99 for the 10GB model going all the way up to $1,999 for the 60GB model. The company was acquired by SonicBlue in October of 2000 and the unit was renamed the Rio Car. Despite the player's rabid popularity among owners, SonicBlue did little to promote the player, and it was discontinued in September of 2001. Only 4,500 players were produced between the two manufacturers. An example of the player is shown in Figure 6. Figure 7. Bang & Olufsen BeoSound2, ca 2001, a stainless steel beauty, had a unique look and a high price tag of $695. 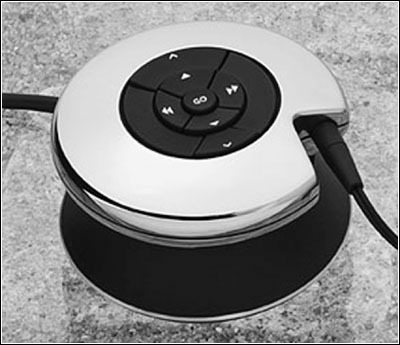 Bang & Olufsen BeoSound2 (2001) ­ This stainless steel B&O beauty had the unique looks and high price tag expected of the company ($695 for a unit with 128MB of memory). The unit is shown in Figure 7. Overall, this offering from the status maker was just an average player, but it was also the most exclusive. Figure 8. 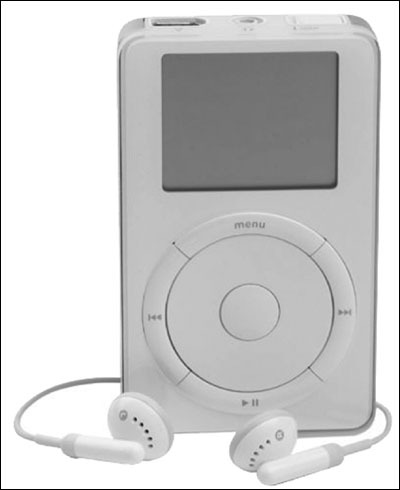 Apple iPod, ca 2001, solved the problems of weight, dimension, and capacity inherent in previous players. Apple iPod I (2001). The first incarnation of the player iPod, shown in Figure 8, appeared in late November of 2001 and was an instant holiday hit. The biggest reason was that the iPod finally solved the weight/dimension/capacity problem that faced all previous players. Thanks to the use of a brand new and tiny 1.8" Toshiba hard drive, the iPod was able to bring in a 5GB jukebox style portable at under seven ounces, half the size and weight of all other jukebox players on the market then. The iPod also had the most simple and convenient interface yet to grace the display of a portable player. Within a year the iPod became a fashion statement for the plugged-in generation and sales exploded. Apple had built a better mousetrap and consumers showed their approval by buying. As of this writing almost seven out of ten digital music portables sold is an iPod, an amazing statistic. Figure 9. 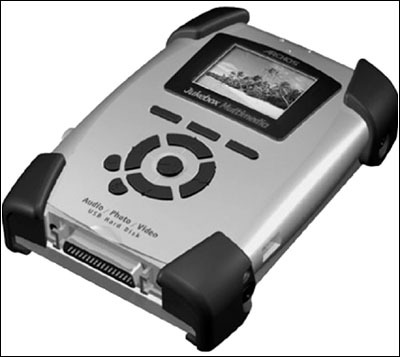 Archos Jukebox Multimedia, ca 2002, was the first MP3 to play movie files in the MPEG-4 format. Archos Jukebox Multimedia (2002). This MP3 portable by French manufacturer Archos was the first to play movie files in the MPEG-4 format. A video/audio media device, the 20GB Jukebox Multimedia, shown in Figure 9, invented a new market segment, which Archos owned unopposed for almost two years. Selling for $400, each unit came with a copy of the animated film Ice Age already loaded on its hard drive to show off its unique abilities. The unit also stored and displayed photographs in the JPEG format, a feature Apple added with the introduction of its iPod Photo in October of 2004. All photos courtesy of the manufacturers. A member of the New Jersey Antique Radio Club, Richard Menta is also the editor of MP3newswire.net. He started the Web publication in December of 1998, inspired by the success of the Rio PMP300. He has been collecting radios since 1996, most of them pre-1940 models. Copyright © 1996-2005 by John V. Terrey - For personal use only. Last revised: June 27, 2005.